Transtech offers a range of hydrology, hydraulics and water resources engineering expertise for project design, development and implementation. We resolve sophisticated engineering and environmental issues with local communities and counties, and State and Federal environmental permitting agencies. 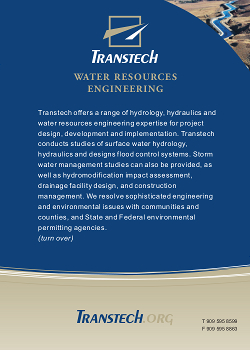 Transtech conducts studies of surface water hydrology, hydraulics and designs flood control systems. Storm water management studies can also be provided, as well as hydromodification impact assessment, drainage facility design, and construction management. We resolve complicated engineering and environmental issues with local communities, counties, and State and Federal environmental permitting agencies. Our strategies are designed to reach, inform and involve constituents and stakeholders of planning proposals, projects and programs. If requested, we can provide opportunities for interested parties to comment, enabling actionable analysis by Transtech of feedback received. 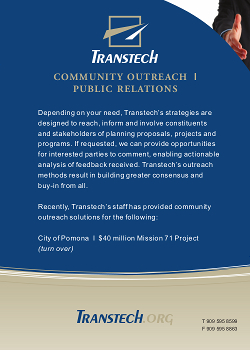 Transtech’s outreach methods result in greater consensus and buy-in from all.